This Irish stained glass picture frame features shamrocks. Sorry, this shamrock photo frame is now sold out. This Irish picture frame features stained glass is enhanced with green shamrocks. 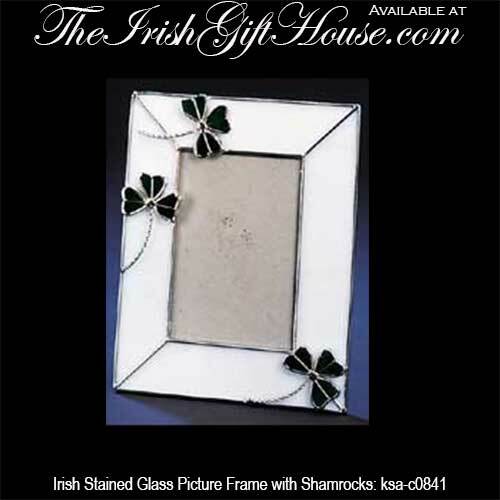 The shamrock picture frame measures 4 3/4" wide x 6 3/4" tall and will hold a 2 1/4" wide x 3 1/4" tall photo. The stained glass shamrock photo frame is ready to stand with the included easel. The Irish photo frame is made by KSA and it is gift boxed with shamrock history card that is complements of The Irish Gift House.